To reveal the energy absorbing mechanism of thin-walled circular tubes made of a T700/3234 composite, tests were first conducted to find its material properties, and then quasi-static axial crushing tests were performed to determine the failure modes and were measured by material performance tests, and the damage mechanism and energy absorption characteristics of the tubes. The effects of the mechanism and ply orientations on the failure modes and energy absorption characteristics were further analyzed. Stacked shell finite-element models are developed using the Puck2000 and Yamada Sun failure criteria and are verified by comparing simulation results with test data. The calculated initial peak crushing and mean crushing forces and the specific energy absorption agreed well with test data. The effect of layer sequence on the energy absorption characteristics of the composite circular tubes are compared on the basis of verified finite-element models. Russian translation published in Mekhanika Kompozitnykh Materialov, Vol. 55, No. 1, pp. 173-192, January-February, 2019. 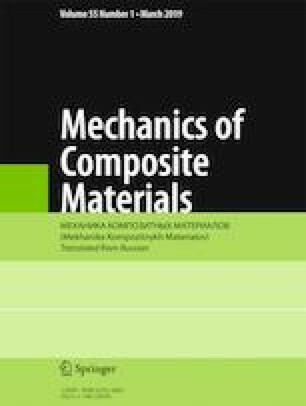 The authors acknowledge supports of the Science and Technology Item from the Civil Aviation Administration of China (MHRD20140207), the Fundamental Research Funds for the Central Universities (3122017020, 2017QD10S), and the Fund of Tianjin Key Laboratory of Civil Aircraft Airworthiness and Maintenance in Civil Aviation University of China.